Looking at someone else’s home videos is usually notoriously boring. As much as you might adore Aunt Susie, watching the iPhone video of her trip to Yosemite is probably not high on your list of fun things to do. A big reason for that is editing — or, really, a lack thereof. Video can be a great way to convey things, but even the most exciting event can be boring if the video has not been edited properly. Even though devices that shoot high-definition video are cheaper and more ubiquitous than ever, amateur videos themselves have not gotten any better to watch. That’s where a new iPhone app called Magisto comes in. Magisto, which debuted its web app in September 2011 and just launched its first iPhone app this week, turns any plain video into a fully edited movie in a matter of minutes. Essentially, it does for movies what Instagram does for photos: It makes even the most mundane media appear more compelling. The greatest thing about Magisto is how dead simple it is to use. You log in with either your Facebook credentials or email address, upload one or several short videos from your iPhone (Magisto prefers to start with videos that are at least 45 seconds long,) select some music (you can upload your own song or choose from Magisto’s library, which is sorted into categories such as “Hip Hop,” “Birthday,” “Travel” and “Christmas”) and then that’s it — you wait for the app to do its magic. The final product is edited to contain your videos’ most “interesting” bits, with music and a few visual effects thrown in to keep viewers entertained. I’ve submitted several videos that are a minute or so long, and Magisto typically took about 10 minutes to turn each one around. You can also use Magisto on your regular computer through its website. Now, Magisto is not for everyone or everything. Since users have very little control over the final product — how long the edited video will be, and what parts it will definitely contain, are completely up to the app — Magisto is only realistic for casual videos of things like vacations and birthday parties. And people who already know their way around iMovie or Final Cut Pro may find Magisto to be frustratingly short on features. But for most consumers who just want to make fun, short videos their friends might want to actually watch, it’s perfect. And the fact that it’s available now on the iPhone is pretty major, since people are increasingly doing everything from their mobile devices. Magisto is run by an Israel-based startup called SightEra, which raised $5.5 million in Series B funding round this past fall led by Li Ka-shing’s Horizons Ventures. I just tried a similar app called Reeli that has a little more control for the user. It’s more like filling out a madlib with videos. First you pick tell the app what kind of video you’re shooting (party, anniversary, vacation, etc) , then you’re presented with a list of ‘scenes’ to shoot like “action”, “who”, “where”. Each of these is between 5-7 seconds long, and the app strings them together (with the song of your choice from your itunes library) into a nice little video that looks pretty good and is interesting enough to keep your attention. It only produces videos that are 45 seconds long, but that’s about as long as I can stand to watch a home video anyway. 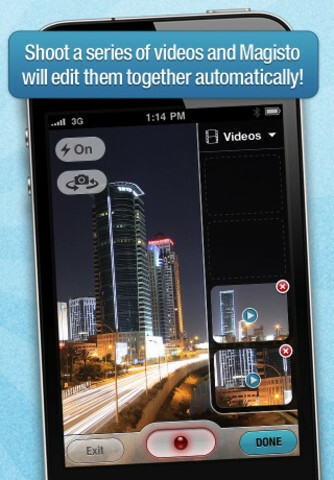 There are a few other apps out there that do this already with no uploading or registering and create edited videos right on your phone. FileSpnr – I’m an editor and I don’t want to sit down and edit every video I shoot. Solutions like Magisto, Vidify and any other app that does this are great for casual users who want to do things quickly and effectively. Plus I have to register or login to use a video editing app? Whit?! These never work. People are just lazy when it comes to video editing. The touchscreen/voice commands will change that, but these automatic apps won’t.